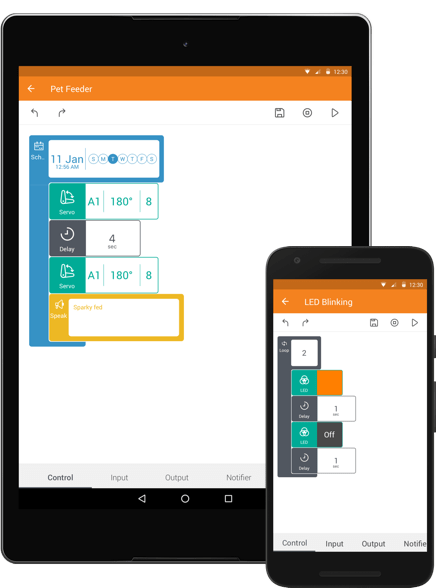 Drag and Drop programming mobile app to unleash the combined powers of Raspberry Pi and Cloudio.This simple, yet powerful mobile IDE abstracts the complexity of development allowing you to accomplish IoT goals faster. 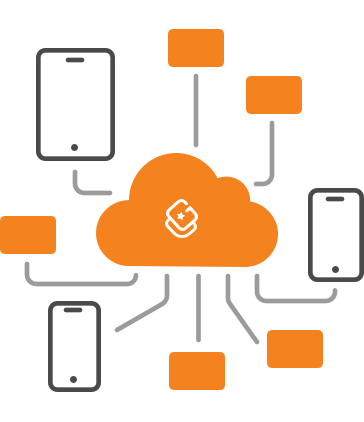 to connect, program, monitor, and manage Cloudio at scale right from your mobile device - anywhere, anytime. 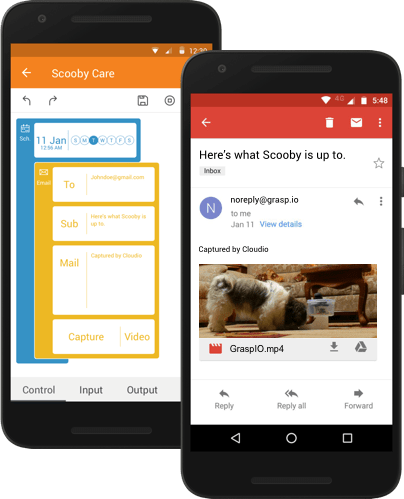 Adding custom notifications, email alerts, real-time data collection, and scheduling to your projects has never been easier. 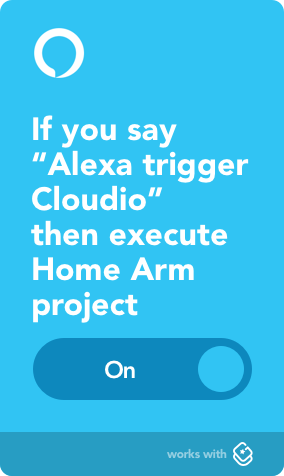 Cloudio works with IFTTT and integrates with thousands of apps and smart devices. 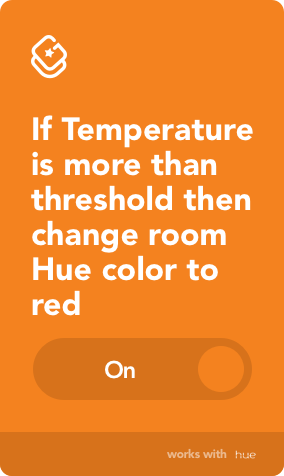 Connect to Amazon Alexa, Philips Hue, Fitbit, Facebook, Google, and many more to create new experiences through applets. Works as both an action and a trigger. 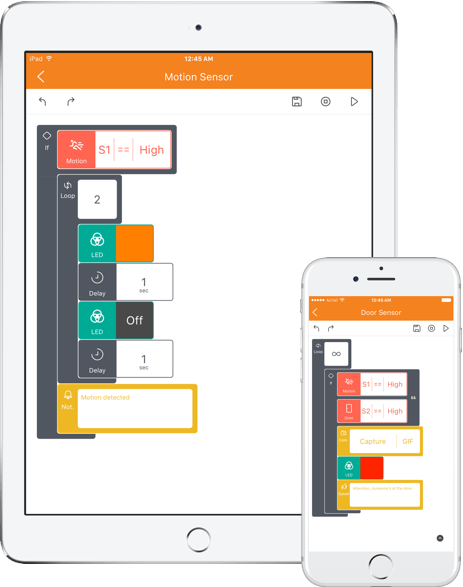 Drag and Drop programming interface on iPhone, iPad, Android. 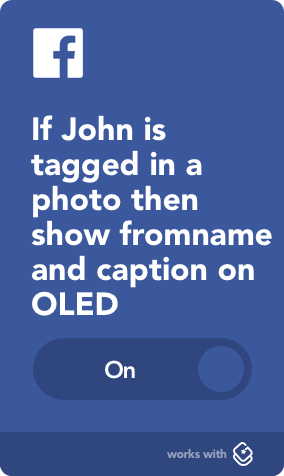 Custom Notifications with Image and Video. 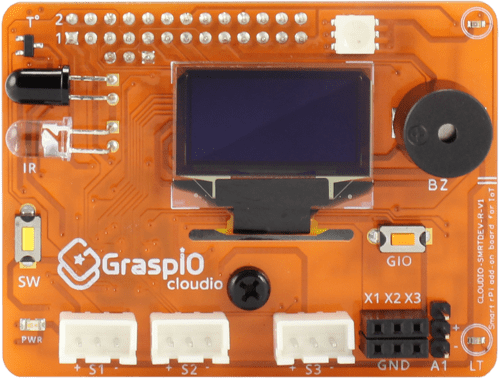 GraspIO Cloudio is exclusively manufactured and distributed by Premier Farnell UK Limited and other companies that are members of Premier Farnell Group. 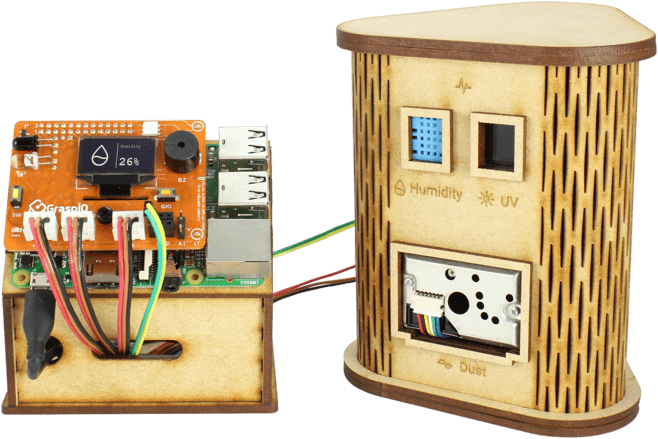 Cloudio is powered by an Atmel 8-bit AVR Atmega32U4 controller to unlock physical computing applications with Raspberry Pi. Works with Raspberry Pi 1/2/3/0/0W. No additional power supply needed, just power on your Raspberry Pi and you’re good to go. 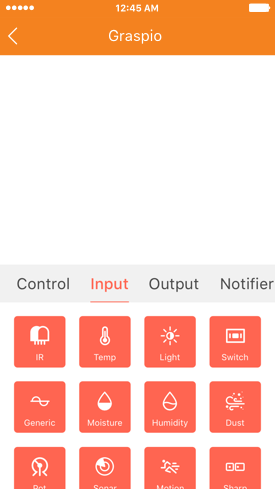 Display real-time sensor values, custom text with stylized font, and playful emojis. 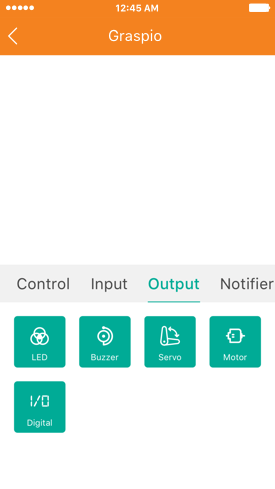 Connect generic sensors and standard sensors like humidity, door, motion, etc. A useful selection of on-board sensors for that perfect out of box IoT experience. Connect relays for home automation related projects. Interface an external servo motor to get things moving. Perfect for pan/ tilt, smart lock applications, etc. 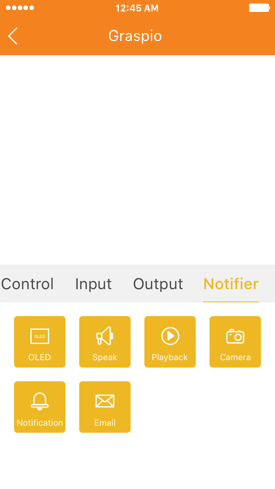 Add visual indicators, audio alerts and alarms to your projects. 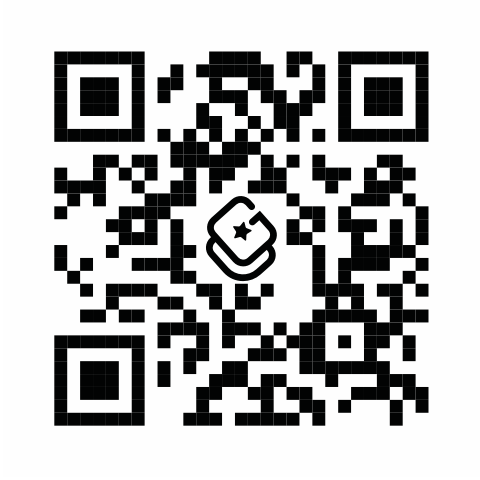 An intuitive mobile interface that lets you program features of Raspberry Pi and Cloudio with a block-based approach. No library integrations, no lengthy set-up procedures, nor the need for multiple software platforms. Create your own voice assistants using the inbuilt speech recognition feature to control Cloudio from your smartphone. 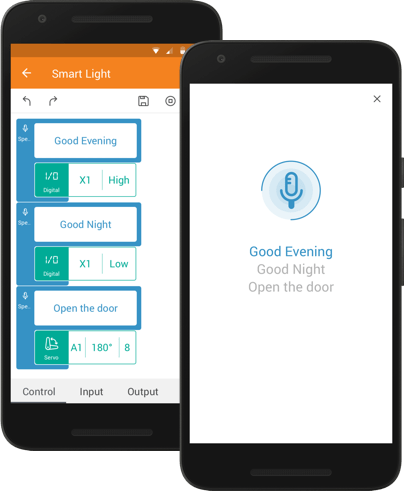 Set your own voice commands to control lights, fans, switches, locks, and more, from anywhere. 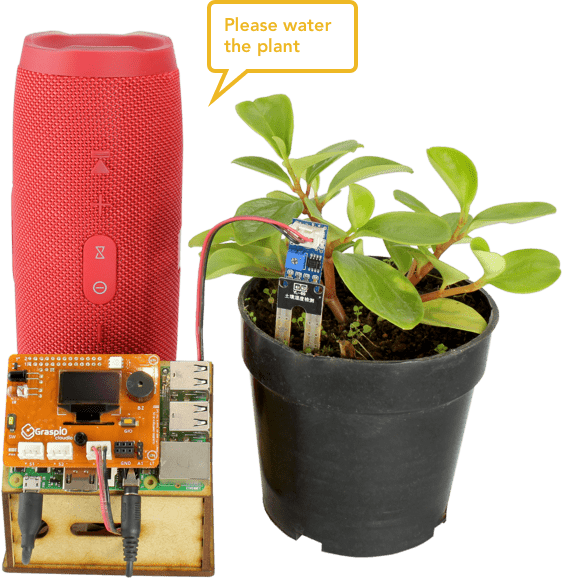 Make your projects talk to you with the easy to use in-app Speak block and Raspberry Pi’s headphone jack. 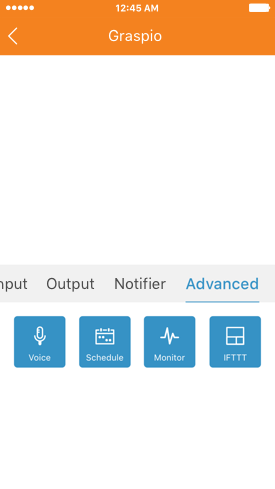 Create real-time speech notifications, custom messages, or play recorded audio from the board. 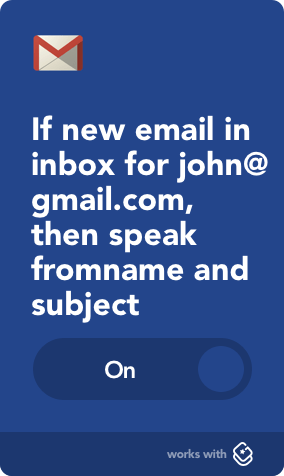 IFTTT meets physical computing with GraspIO Cloudio. 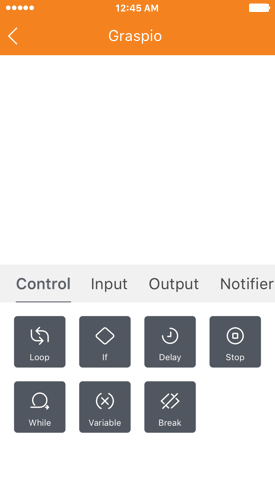 Create simple applets that use Cloudio’s features as both triggers and actions for a new connected experience. 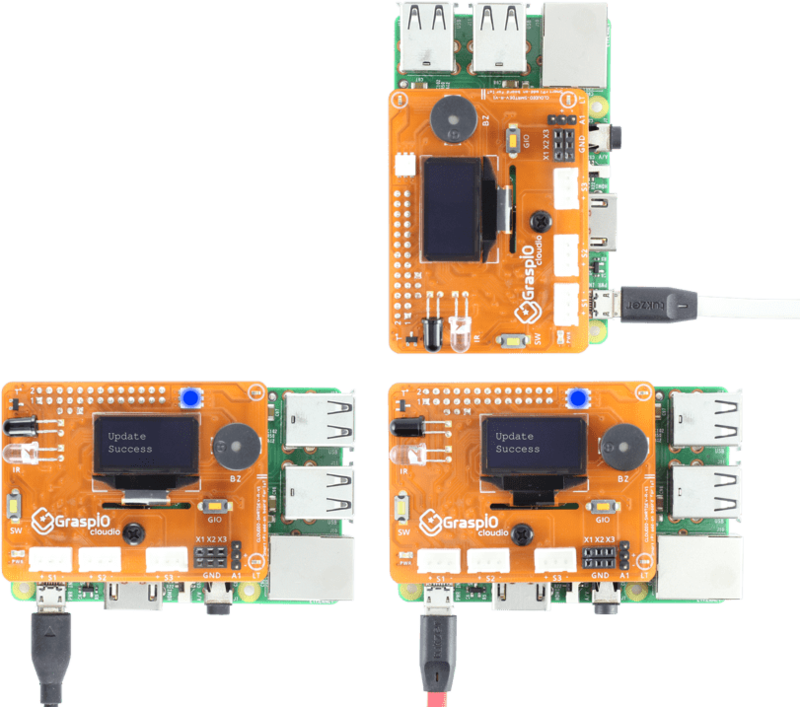 Use Cloudio’s on-board or external sensors and deploy it as an Edge device to design intelligent and responsive sensor monitoring projects. 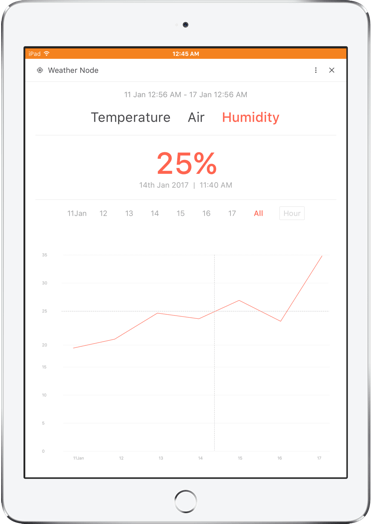 View real-time sensor graphs on your mobile device and export data for IoT analytics. 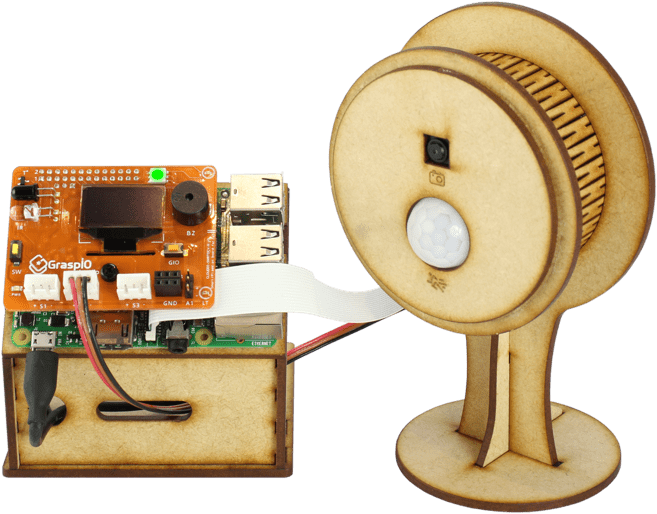 Interface a Raspberry Pi or USB camera effortlessly with the in-app Camera block to capture images, videos, create GIFs and time-lapse videos. Keep an eye on your projects by adding email, image, and video notifications. Updating projects on your collection of boards is now quick and simple. 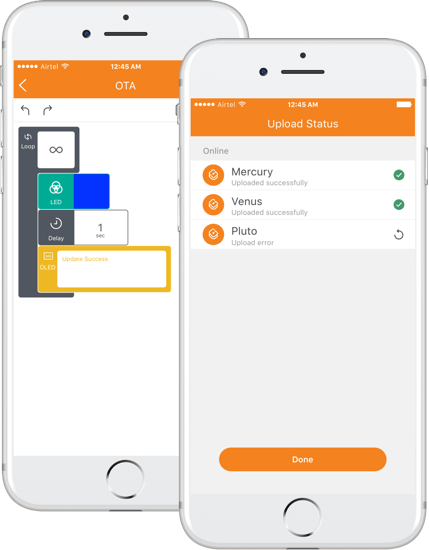 Use your smartphone to connect, program, control, monitor, and manage multiple Cloudios over the internet - anywhere, anytime. Grasp IO Innovations Pvt. Ltd., based in Bengaluru, India, aims to make the world of electronics and programming less technical and more practical for learning, prototyping, and play. 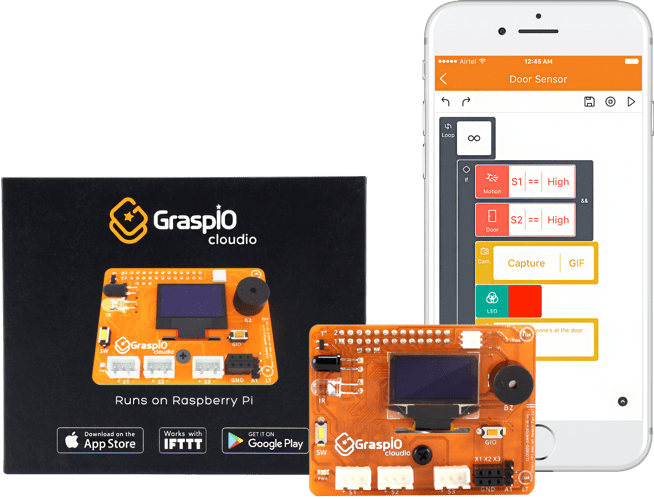 GraspIO Graphical Smart Program for Inputs and Outputs is a part hardware and part software platform that offers the user the ability to quickly build IoT and Robotics. A Cloud Call is a traffic based measurement. Any one-way communication between Cloudio and Studio App via IoT Cloud is one call. are credited to the user’s account for life.  Cloud Calls plans that require usage above these limits can be purchased via the GraspIO Studio app as per the payment terms outlined therewith. © Grasp IO Innovations Pvt. Ltd. All rights reserved.